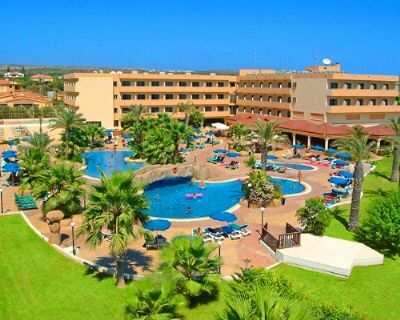 Ayia Napa has a massive choice of places to stay on your holiday. 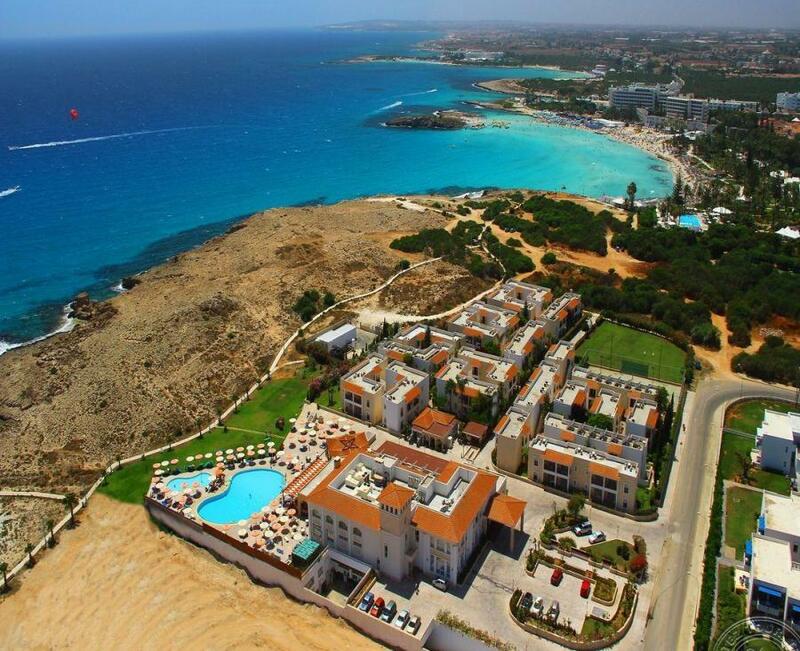 There are over 150 hotels, apartment complexes and villas in Ayia Napa to choose from. 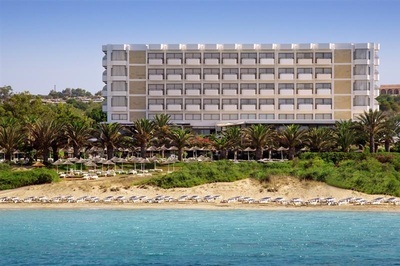 Ayia Napa is a big resort and it's accommodations are spread out with some being near the town centre, some near Nissi beach, some near the harbour and some further out on the edges of the town. It can be hard work picking somewhere to stay in Ayia Napa if you've never been before, so we've put together this guide to help you decide which accommodation will be right for you and where to find the best deals on your hotel booking. Further down the page you will find information on the standards of accommodation in Ayia Napa, which hotels and apartments are located where in the town and where to look to find the cheapest prices on your accommodation. What standard of Accommodation is there in Ayia Napa? Ayia Napa has lots of different types of accommodation to choose from for your holiday. Most travel companies will give hotels and apartments their own ratings based on comparisons to accommodations in other countries or feedback from guests. As Cyprus's official ratings can be worked out differently than other countries, you may see the same hotel or apartments rated as 2*, 3* and 4* by different companies. One of the best ways to find out if a particular hotel or apartments is right for you is to check the reviews on TripAdvisor, to see what other travellers like you have said. Hotels - There are hotels which range from a 2* up to a 5* of international standard, they range from luxury hotels and beach hotels to family friendly resorts. 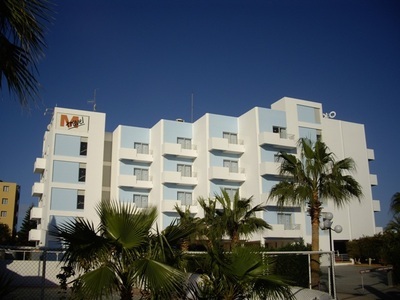 Apartments - Apartments in Ayia Napa are rated as either hotel apartments or tourist apartments. Hotel apartments are rated from A class to C class with A class being the highest. The ratings are generally based on the facilities that are available on the apartment complex and not necessarily the cleanliness, standards of service or anything else. Tourists Class apartments will not have a pool, nor a bar and sometimes not even a reception. The standard may be higher or lower than hotel apartments but the main difference is the lack of facilities that are available on-site. The A to C class ratings do not translate into star ratings very well and so most accommodation providers and travel companies will give hotels and apartments their own ratings based on reviews and comparisons to similar accommodation in other countries. Villas - Ayia Napa has a selection of villas which are mostly located at the edges of the resort in either the Ayia Thekla or Cape Greco areas. Villa's are not given star ratings as standard, though you may see some rated as gold, silver or platinum. Holiday Villages - Holiday villages are sometimes rated in stars and sometimes in classes. Generally they are of better standard and with more facilities than hotel apartments but sometimes with lower quality sleeping accommodation than actual hotels. Where to book your Ayia Napa hotel, apartment or villa. 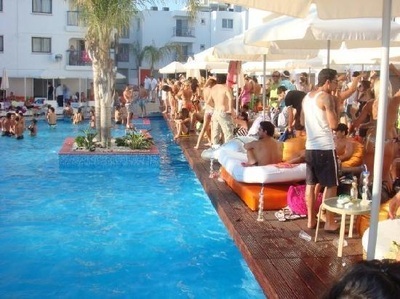 There are loads of travel companies which sell hotels and apartments in Ayia Napa. It can be hard work searching them all for the best deal so there are several hotel search engines which can do the work for you. The biggest of these are Hotelscombined and Travelsupermarket, who search and compare lots of deals available for the same hotel to help you find the best price. The biggest accommodation companies to book through for Ayia Napa are Hotels.com and Booking.com, both of which offer a wide range of hotels. You can also find numerous offers through online travel agents such as Expedia, On the Beach, Lastminute and Thomas Cook. 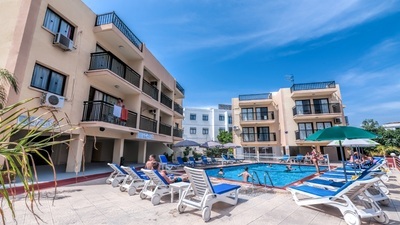 It's worth checking out a few different companies to find the biggest choice of hotels in Ayia Napa, some may have different room types or offers available. If you want your holiday in Ayia Napa to be one non-stop party then choosing one of the livelier apartment complexes would be the best choice. These hotel apartments often hold pool parties, have 24 hour bars and will be mostly full of young people. It will be loud, full on and not the place to relax, unwind and get lots of sleep. The following apartments are the busiest and loudest party hotels to stay in. 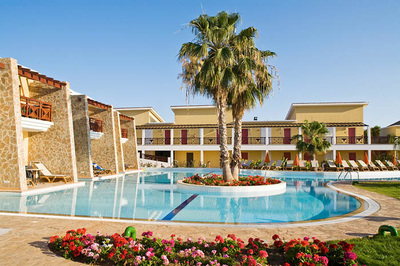 Ayia Napa has a good selection of high quality luxury hotels. Most are beachfront and are located in either the Nissi Bay or Grecian Bay areas. They are popular with all ages and nationalities, including families and older people. 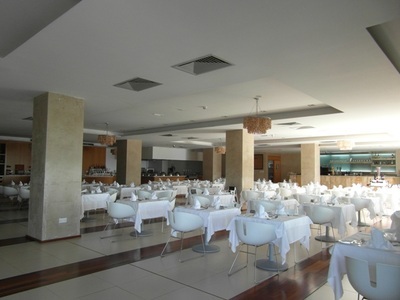 You will usually find entertainment and lots of facilities on-site including indoor pools and a choice of restaurants. Weddings are held at many of these hotels and some are open all year round. 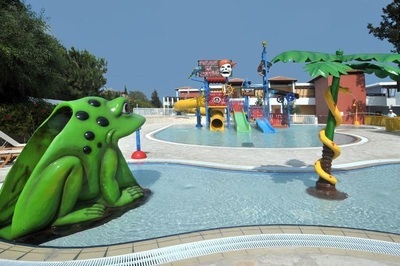 A holiday villages gives the best of both worlds for families and groups who want the flexibility of apartment and self catering style accommodation with the on-site facilities of a hotel. 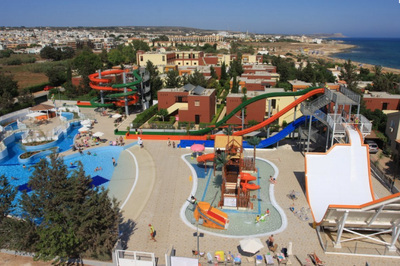 Ayia Napa's holiday villages are low rise and have good pool and on-site facilities, are family friendly and have entertainment. Most are located away from the town centre, closer to Nissi Beach. 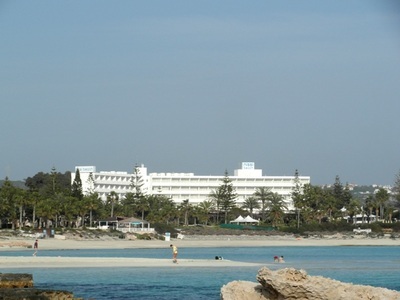 Ayia Napa harbour area is a lovely place to stay with easy access to the seafront and beach. There are loads of great restaurants in this area and a handful of chilled out bars to spend an afternoon or evening. It's quiet enough for a relaxing holiday but the centre of Ayia Napa is still only 10 minutes walk away giving you the best of both world. uNissi Bay is almost a mini resort in itself. 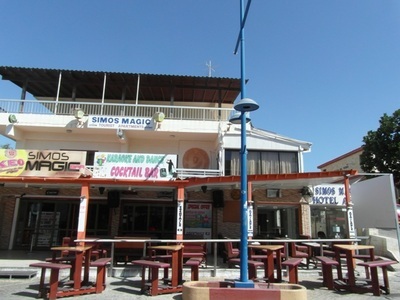 Located at the western end of Ayia Napa it is about 30 minutes walk from the town centre. This is a busy area during the day with people from the town flocking here for the lively beach scene, but at night times it becomes tranquil and peaceful. The Nissi Bay area is ideal for families, couples and beach lovers looking for a quieter base with the nightlife within easy reach. There are several websites where you can compare prices on flights, accommodation and package holidays from lots of companies all in the one place. This can save you time and may ​find you a deal with a company you hadn't thought to check. ​Compare package holidays on Travel Supermarket, Booking Buddy.